Taking the form a good-length feature film, the Third Stage of the highly popular Initial D series proves more satisfying than initially expected, particularly as there was talk in some circles it functioned primarily as a stepping stone to the more expansive and action-packed Fourth Stage. The current Stage sees street racer extraordinaire Takumi Fujiwara approaching high school graduation. His services in demand, he is approached by fellow racer Takahashi Ryousuke, who wishes to recruit the by-now famed Takumi to his fledgling racing team with the intention of challenging, and defeating, some of Japan’s greatest racers on their home turf. The Third Stage also focuses more on Takumi’s tempestuous relationship with his girlfriend Mogi, and provides moments of emotional progression that neatly temper the testosterone-fuelled downhill racing scenes. But fear not! There are still plenty of these to be had, and amongst Takumi’s soul searching are some moments of spellbinding intensity certain to appeal to petrolheads the world over. In the scope of the overall series, Third Stage is probably one for the fans, and newcomers would be advised to start elsewhere. Those who have been with the show from the start, however, will find much to recommend it. Despite being almost a decade old Third Stage holds up extremely well. Backgrounds are textured and luminous, the CG racing sequences are well staged and yes, the character designs can be a little uninspired, but as ever they prove more than adequate to requirements. At any rate the fact that the characters occasionally verge on the generic simply reinforces who the real stars of the show are: the cars. The film is presented in a lush 16:9 widescreen aspect ratio that looks great and fills the screen to good overall effect. There are no artefacts or visual defects to speak of, and Funmation appear to have done an excellent job restoring the film to its full glory. The Region 4 DVD release features English and Japanese 5.1 surround audio. Both are well-balanced and expansive, and feature the usual suitably up-tempo J-Pop accompaniment and a neatly atmospheric score. Funmation’s new English dub is actually very good, though why you’d watch anime in any language other than Japanese is beyond me. The English subs are consistent and error-free. 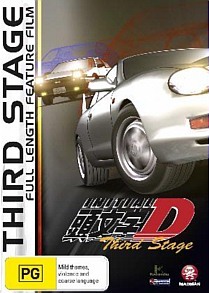 Though Funmation and Madman have been doing a great job with the overall packaging and presentation of the Initial D series thus far, they have been a little light on bonus features and Third Stage is no exception. All that’s on offer are trailers for Evangelion, Fullmetal Alchemist, Initial D Fourth Stage Collection 1 and King of Bandit Jing, prefixed by an anti-piracy warning.